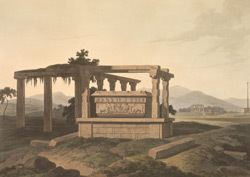 Plate 14 from the fifth set of Thomas and William Daniell's 'Oriental Scenery' called 'Antiquities of India.' The Daniells wrote, 'This stone cistern, which is very singular in its form, and in its style of decoration, was evidently intended for the purpose of containing water.' Attached once to a now vanished temple, it is carved with Vijayanagar-style reliefs of dancers and elephants.